In this piece, the team at Chartmetric explore the recent meteoric rise in popularity of emo rap, and how a number of male rappers in an often machismo laden field have managed carve out significant success by focusing on themes of depression, anxiety and suicide. With a steadily growing following, brash yet introspective “emo rap” artists such as Juice WRLD or Lil Uzi Vert could be seen as one of music’s newer trends. But the youthful malaise and diversion from the mainstream is timeless: they echo the spirit of Sid Vicious and Kurt Cobain more than they do today’s Jay-Z or Cardi B. Unless you’ve been a decades-long rap fan, it’s tempting to say that their emotionally-raw and vulnerable rap lyrics are a new thing. But references to Notorious B.I.G.’s 1994 “Suicidal Thoughts”, Tupac’s or Eminem’s frequent themes of dark introspection in the 1990s/2000s, or large swaths of Kid Cudi’s work in the late 2000s/early 2010s would surely refute that idea. But what does seem to be unprecedented is the high-profile commercial success of several male rappers in a machismo-laden genre that don’t just dip their toes in such taboo topics such as depression, anxiety, and suicide: it’s their signature. Emo rap, SoundCloud rap. It has several names. Its artists typically make beats with software and upload directly to sites like SoundCloud or YouTube. Many of them draw influence from early ’00s punk and alternative rock bands- Foo Fighters to Chief Keef and Kid Cudi (Chicagoland’s Juice WRLD), as well as Nirvana, Papa Roach and the Fray (XXXTentacion). Some are completely independent artists, some with a label. All are empowered with social media reach. With such non-mainstream sounds and dark themes, it’s less likely that “emo rap” will ever eclipse the power of wedding-friendly Ed Sheeran ballads or clear-the-dance-floor Bruno Mars party joints…so searching for who has the most followers/streams/views might not be the best way to gauge such content. In the modern music business, professionals are deluged with key performance indicators (KPIs) like Spotify spins, Apple Music playlist placements, Instagram followers, YouTube views…the list never ends. Most of the time, it’s just a “who’s got the most” game. A major focus of Chartmetric is looking for Music Analytics 2.0…or what we believe will be the next level of our industry’s business intelligence. We believe the use of relative metrics like listener to follower ratios, “event decay” or less familiar data sources like Wikipedia help get to what is really the most bankable of variables: curiosity/love of the artist and true fan engagement with their content. With that, the business will follow. Of course, these are target variables that will (likely) never be directly measurable, so we look to second-level, proxy variables or unorthodox data sources like the above. We’d like to use emo rap to explore two more of these uncommon data sources: Google Trends and Genius lyrics. We will focus on the most notorious artist in today’s pop zeitgeist: XXXTentacion (subsequently referred to as “X”). In case you are not familiar with his work, his credentials: “17” album debuted #2 Billboard Top 200 Albums chart (Aug 2017), “?” album- debuted #1 Billboard Top 200 Albums chart (March 2018). His single “Sad!” peaked at #17 on the Billboard Top 100 before reaching #1 posthumously after his death (June 2018), breaking Spotify’s record for most streams in a single day (previously held by Taylor Swift’s “Look What You Made Me Do”) with 10.4M spins on June 19, 2018. Much has been written about X’s short life and controversies. We will focus on how his fans loved him and his work with these two data sources. When dealing with difficult subjects such as mental health, frequently family and friends are left out of the conversation. Ironically, many of our deepest, darkest secrets only surface in the air-conditioned servers of the world’s most powerful search engine and music streaming platforms. Mental health- a topic steadily becoming less “taboo”- seems to finally be on the pop culture table for open discussion. In looking at Google Trends, the idea is to understand in a data-driven way how an artist can affect culture: how do artists advance our collective processing of difficult topics? To begin a dive into Google Trends, we compared the queries for the keywords “depression”, “anxiety” and “Xanax”. Decades old but as of late popularized by emo rap, Xanax is a drug frequently prescribed by doctors for anxiety. The Pudding determined that it was 47 times more likely to hear this word in a hip hop song than in any other genre. For every time period / geographic area searched, Google Trends identifies the most popular search point of your query and establishes that as “100”. The number is relative in nature (it’s meaningless alone). It indicates peak search interest and then calculates all other search frequency relative to that highest point on the chart. This can be done with one or several search terms. When examining since the beginning of Google’s historic data (2004), the search term “depression” trends higher during the fall and spring seasons, with it dropping during the December holiday season and the summer. Over time it was searched for far more often than “anxiety” and “Xanax”, though “anxiety” is increasingly more searched year-over-year. In mid-2015, “Xanax” slightly increased annually from a 20–25 range to the 25–30 range. From this brief look, we can infer that depression seems to have been a relatively steady public interest for the past 14 years. Xanax as a drug seems to have been around the entire time, with only slightly increasing interest in the past three years. Anxiety, however, has shown remarkable search term growth since 2010. Google Trends also finds “Related queries”, which track what other keywords users search for within the same search session. The implication is that users are associating your searched keyword with these related queries. XXXTentacion becomes relevant when querying Google searches of “depression” within the US. We focus on the US as over 54% of his YouTube views are from his home country, with 26% (#1) of his Facebook fans and 37% (#1) of his Instagram followers are also American. XXXTentacion’s fanbase is firmly rooted in the U.S. 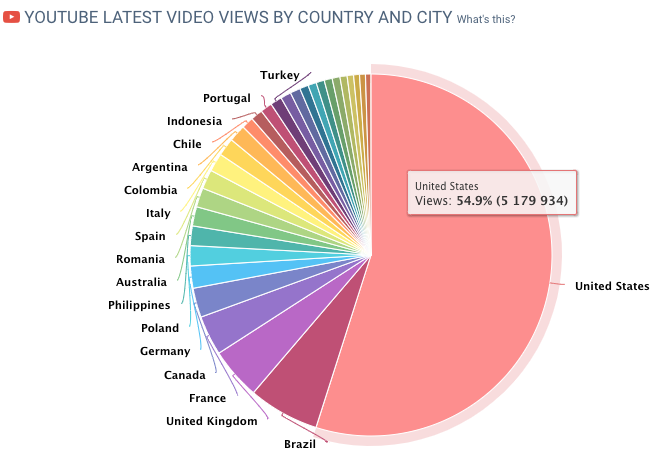 Here, his YouTube resonance by country. 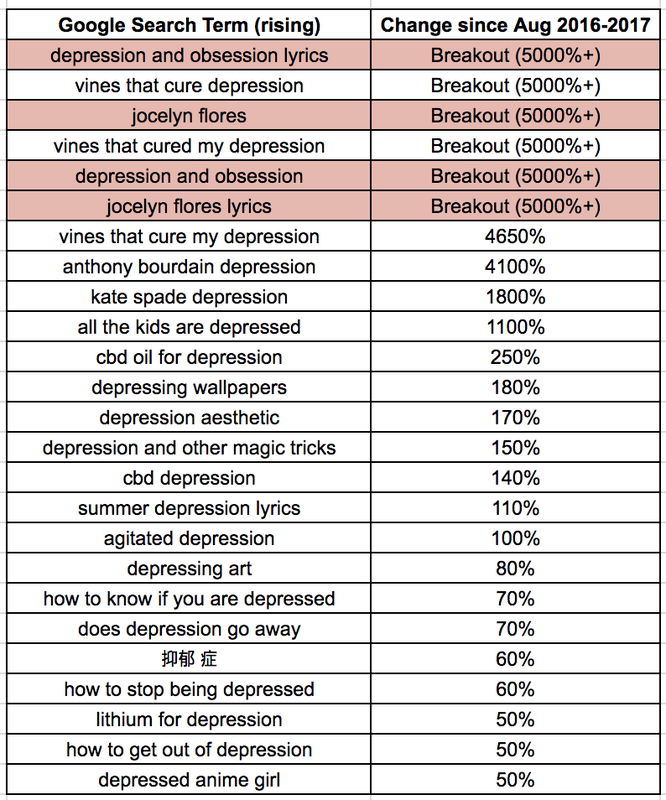 At the time of writing, within the past 12 months and searching only the topic “Depression” with no other keywords, four of the top six “breakout” related queries are XXXTentacion-related (“breakout” means an increase in at least 5000% from the last time period). Here, two tracks from his Aug 2017 album “17” make an appearance. “Depression and Obsession” deal with what seems to be a failed romantic relationship, and “Jocelyn Flores” is about a friend that took her own life. 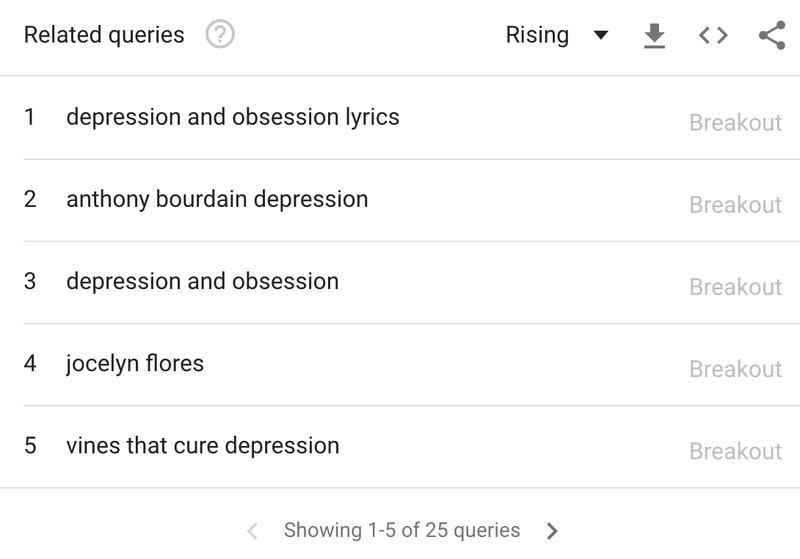 Four of the six Google Trends “breakout” (5000%+) related queries with the “Depression” topic are related to two XXXTentacion songs. It should be noted that this is a country-wide search over one year, beginning on the album’s release date. To benchmark this unorthodox measure of engagement, this same time-period also included two high-profile suicides (designer Kate Spade and celebrity chef Anthony Bourdain) that occurred in June 2018 (correlated with their bouts with depression). When using Google Trends, the location and time period are of highest importance to understand what Google users are also curious about within the same “search session”. For one artist to be so associated with such a large topic as depression (it was even searched in Simplified Chinese at 60% change, as seen above) on the world’s most popular search engine seems to be a considerable measure of relative cultural impact. Consider that the Billboard Hot 100’s suicide-prevention anthem “1–800-273–8255” by Logic, Alessia Cara and Khalid was performed at the MTV VMAs (Sept 2017) and 60th Grammy Awards (Jan 2018). Yet, it did not show any related query correlation to “suicide” or “depression” on Google Trends from Sept 2017 to now. It did thankfully seem to affect the Suicide Prevention Hotline’s call volume on both occasions due to its obvious title. You may have noticed that both of XXXTentacion’s songs listed above were queried by “title” and then “title” + “lyrics”. This is where Brooklyn-based media company Genius comes into the picture as our second source of relevant data. The Genius header for X’s “Jocelyn Flores” lyrics page. For those not familiar, Genius is in the business of bringing “music intelligence to the masses” by crowd and artist-sourcing lyrics, production notes and stories behind the music, with “over 2 million contributors, editors, and musicians” in its community and “over 25 million songs, albums, artists, and annotations.” It has effectively become the hip, tech-oriented scalable version of the countless lyrics websites in existence. Genius donned X as “the most popular new artist on Genius” in 2017 and #5 overall, with over 20M page view across his catalog, beaten only by veterans Kendrick Lamar, Drake, Ed Sheeran, Luis Fonsi & Daddy Yankee. Despite his Billboard charting and Spotify achievements, X’s content is still dwarfed in magnitude, scale and precedent by the biggest names in music. Among the artists of Genius’ 2017 Top 10 most viewed songs, X’s ability to exceed Genius follows per year over Logic, Ed Sheeran, Migo and Cardi B is quite an accomplishment. Interestingly, in looking at the artists with the Top 10 most viewed lyrics on Genius in 2017, X has the #2 most Genius followers (to their artist profile) per year active on the platform (launching in 2009). He only comes behind Kendrick Lamar, whose long track record of lyrical prowess proved too much for X’s short-lived career. However, X’s ability to still trump the rest of this star-studded list must say something about how his fans engage with his content…not just to dance or mosh to…but to read, understand and digest. In an effort to understand how much Genius/Spotify users are interested in a certain track, we experimented with a “lyric resonance” ratio. This is simply a track’s Genius page views divided by its Spotify spins multiplied by 100 (for readability). It’s an imperfect equation that likely also rewards popular songs with exceedingly incomprehensible lyrics or non-English language content. X’s two tracks surprisingly don’t do well in this grouping. Both beating only Ed Sheeran’s “Shape of You”, and one track beating out fellow “emo” rappers Future and Lil Uzi Vert, they are both overcome by the rest of the dataset. However, for such a relatively junior artist to be able to stand toe-to-toe in lyrics engagement in this grouping is still worth noting. Most surprisingly, British comedian act Big Shaq stands tall above all the A-list musicians with a 4.43 lyric resonance, with the #2 track being the Spanglish juggernaut “Despacito – Remix” by Luis Fonsi, Daddy Yankee and Justin Bieber at 1.97. There’s a lot to think about here: how should one measure Big Shaq’s novelty “Mans Not Hot” track against a dark themed track like X’s “Jocelyn Flores”? Does the Spanish nature of “Despacito — Remix” on an English-centric website like Genius make it more of a translation exercise, or are fans really engaged with the sensual themes of the song? Does Logic’s “1–800–273–8255” theme of depression and suicide, which is in the ballpark of X’s work here, get a boost due to Logic’s more mainstream-friendly persona and MTV/Grammy visibility? X’ “SAD!”, which reached Billboard #1 Hot 100 slot after his June 2018 death. Fan engagement is a complex target variable, and it happens at both surface and deep levels. Club hits and cocktail party music may be more easily measured in simpler metrics, but for more intimate and dark material such as “emo rap”, we may have to be more creative in our approaches such as utilizing Google Trends and Genius lyrics pages. Our most progressive- and frequently the least liked- artists push the edge, make us uncomfortable, and advance our public conversations through their work. Their content can be as complex as it is revolting, as resonant as it can be dangerous…but it is culture nonetheless, and our business must understand it to best serve the fans. We’ll continue to experiment with new sources of pop culture data to most accurately measure that at scale. If you’re looking for someone to talk to, don’t hesitate to contact the National Suicide Prevention Lifeline at 1–800–273-8255, or text “home” to the Crisis Text Line at 741741 in the US.